Getting lost can be one of the most time-consuming and frustrating parts of travel. It can also be one of the most exciting, and occasionally it can lead you to discover something you never expected to find. It’s a fine art, to be able to get lost and make it into something meaningful. Some of the most special moments I’ve had while traveling have been happened upon by chance while wandering aimlessly around. Sometimes you don’t know what you’re looking for til you’re looking at it. We had an amazing two days exploring the vast, majestic, fairy-tale temples of Angkor Archaeological Park. I plan to do a longer post about that adventure at a later time. Millions of tourists come to Siem Reap to visit Angkor Wat each year, often on packed tour buses and tromping around the temples in droves, getting in the way of everyone’s photos. To avoid the crowds, we decided to do the ‘Little Loop’ of Angkor backwards, starting with the temple most do last and working are way around to the beginning. This worked pretty well for avoiding the mass of tourists. It did, however cause a little bit of confusion as we tried to navigate some of the trails backwards, following signs with arrows that say “Way of Visit –>” in the opposite direction. 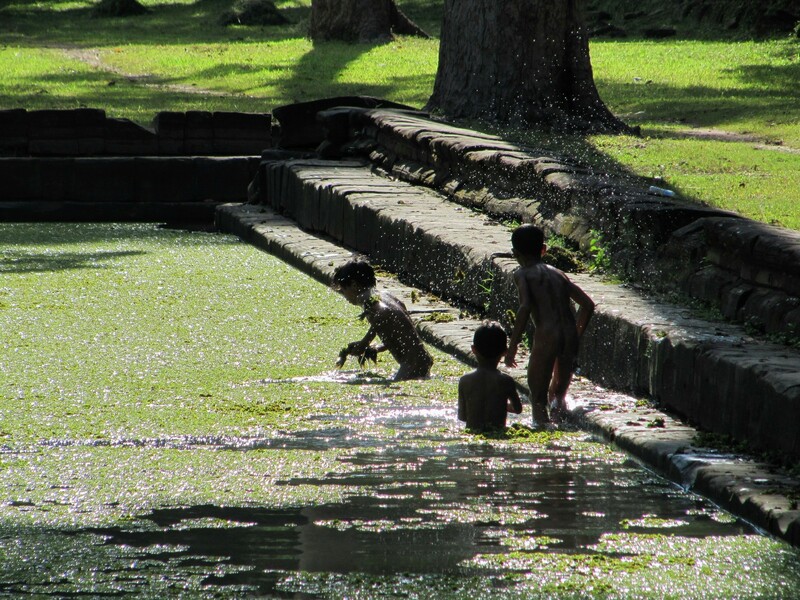 Inside the complex of Angkor Thom, we were randomly strolling around the forested footpaths, looking for the next temple, when we came across a bunch of local boys swimming in a serene, mossy pool. 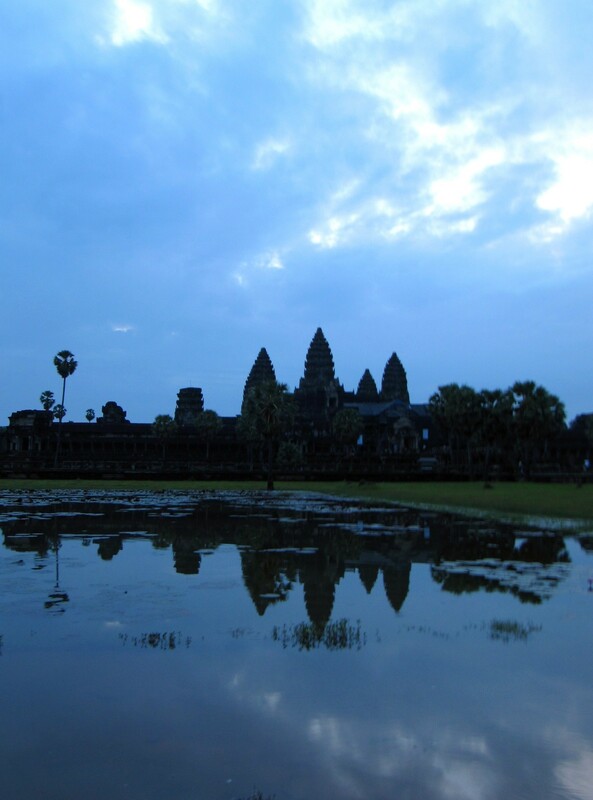 An ancient pool in Angkor Thom. 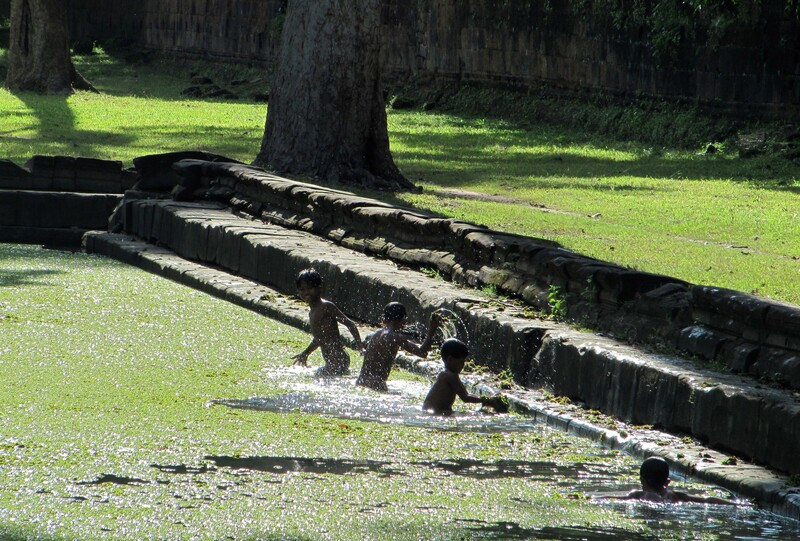 Looking for some fun after a long day of hawking bracelets and postcards outside of the temples, the young boys were having a water fight in an ancient pool in the ancient city, built by King Jayavarman VII in the 11th century. A blissful reprieve from the afternoon humidity. They didn’t realize that some tourists were strolling around the pool, or didn’t care. Jumping, swimming and splashing around in the overgrown green pool, it was the perfect portrait of carefree youth, and I couldn’t resist from taking a few pics. This is what travel is all about to me: Finding a genuine, personal moment of a place and a window into the lives the local people who live there. Even if you can just catch a glimpse from afar. It’s these moments that stay in your emotional memory and make you feel connected to the places that you visit. There are amazing little moments to be found everywhere in the world, if you just open your eyes and open your heart, and look around. Well, that’s all the sentimental babble I have for today. Thank you.